In this article I want to look at some associations with the Vedic god Indra which have found their way into Buddhism. 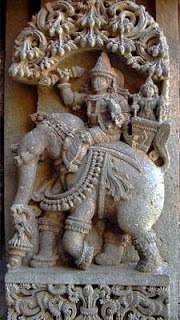 Indra, under the name Sakka, is a frequent character in the Pali texts, and plays an active and positive role in the Jatakas. Although Buddhists acknowledge no creator god, no supreme being on the model of Jehovah, gods do play an important role in the Buddhist religion. My starting point will be two mentions of Indra by the 9th century Japanese master Kukai, who I've written about on several previous occasions. 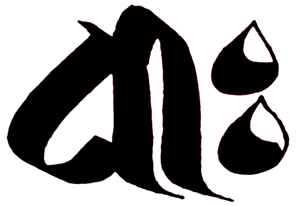 In Kukai's writing there are several references to Indra. He uses the image of Indra's Net frequently. It comes from the Avatamsaka Sutra where it conveys the idea of the interpenetration of all things by all things, that is central to Kukai's understanding of the Dharma. I want to pass over this image, however, and look at two other references which are quite different in nature and relate to Indra's role as a god of speech. The perfectly Enlightened One's mantras Are made up of syllables, names, or clauses; Like the statements of Indra, They are meaningful and effective. In the first instance Kukai explains away the presence of Indra as an authority on truth by equating the name with a secular Sanskrit grammarian known as Shakradeva. This is plausible, but I think there is a better explanation. In the Shatapatha-Brahmana there is a sory about Indra defeating the demon Vritra. Indra is cheated out of part of his reward by the messenger god Vayu, and as a result decides to make only one fourth of speech, that is the vocal sounds of humans only, intelligible. The speech of birds, animals, and insects are therefore unintelligible. Beck points out that this is a reworking of a Rigvedic myth which reinforces Indra's role as grammarian, or as the god responsible for making Vac comprehensible. 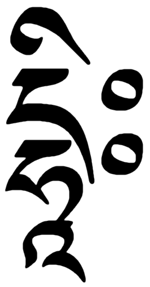 Later, although still prebuddhist, in Chandogya Upanishad it says "all vowels are embodiments of Indra" (CU ii.24.3). It seems as though Indra maintained this function in the Mahavairocana Sutra, although this does not sit well with Kukai. This is what the divine voice that is thunder repeats: 'DA DA DA', 'Be self-controlled! Give! Be compassionate! Now although it is said to be Prajapati speaking it is very clear in Vedic myth that thunder is associated with Indra. Indeed one could say that for the Vedic speaking people Indra was thunder. So this would seem to be one of those cases, common in Indian texts, where one god has assumed the attributes of another. Further more we see the idea that a single syllable can have very different meanings - a phenomena modern scholars call polysemy (from the Greek = multiple meaning). This is precisely what Kukai is exploring in the Ungi gi. Kukai allows for infinite meanings, not only for hum itself, but for each of it's constituent parts. Later on Indra's role as Vagishvara - or lord of Speech - was taken over by the bodhisattva Manjusri who, in early Chinese imagery, is sometimes depicted as riding a white elephant, just as Indra does. Manjusri has yet to take up this role in 9th century Japan. It is possible that had not occured even in China, which is the likely home of the cult of Manjusri. As the original wielder of the thunderbolt or vajra, Indra is also a model for Vajrapani. Europeans have found a strange difficulty in understanding the real relation of Sakka to Indra... Sakka belongs only to Buddhist mythology then being built up. He is not only quite different from Indra, but is the direct contrary of that blustering, drunken, was god. As I have said, Indra, often plays a positive role in the Jatakas, and is often shown payin homage to the Buddha. He appears to be a representative of the old Vedic gods, and is often paired with Brahma representing the later Vedantic gods. Even in this brief treatment I think you can see that the Vedic Indra did indeed find his way into Buddhism and that these two roles - the one who makes things meaningful, and the one who allows for polysemy - are present in the writing of Kukai in 9th century Japan. These things are impossible to prove of course, and there may be some 'black swan' piece of evidence waiting out there to show the theory to be wrong, but the precedents existed and Buddhists have a long history of borrowing from their surrounding culture, so the circumstantial case is quite good. quoted in Beck, Guy. Sonic Theology. p.26. Rhys-Davids, Pali-English Dictionary. sv Inda, p.121.